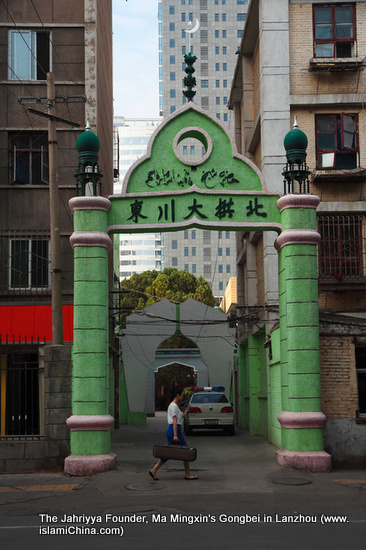 Founded by Ma Mingxin in 1760s, Jahriyya is a Naqshbandi Sufi Menhuan order in China practiced by Chinese speaking Hui Muslims. The name of Jahriyya comes from the Arabic word Jahr meaning loudly. The adherents of Jahriyya Menhuan recite Dhikr loudly which contrasts with the more typical Naqshbandi practice, observed by the Khufiyya of reciting Dhikr silently. Ma Mingxin also opposed the emphasis that the Khufiyya members placed of the veneration of the saints, construction of grandiose elaborately decorated gongbeis, and the enrichment of religious leaders at the expense of their adherents. Ma Mingxin strongly criticized the competing Khufiyya order for passing its leadership from the order's founder, Ma Laichi, to his son, Ma Guobao. Ma Mingxin himself chose his own successor as the head of the Jahriyya based on his Islamic scholarship and piety; later on, the third leader of the order was chosen in a similar way. However, later leaders of Jahriyya appointed their son to be the next leader before they died. Distribution: Xihaigu of Ningxia, Pingliang of Gansu, Xinjiang, Yunnan, Jilin, Hebei and Shaandong Provinces. Distribution: Zhangchuan, Guanghe, Huicheng of Gansu Province. Distribution: Wuzhong, Lingwu, Tongxin of Ningxia, Xinjiang.